There’s no shortage of RSS readers on Android. gReader is a fairly popular RSS client that give users the ability to stay up-to-date with all the latest happenings on the internet. 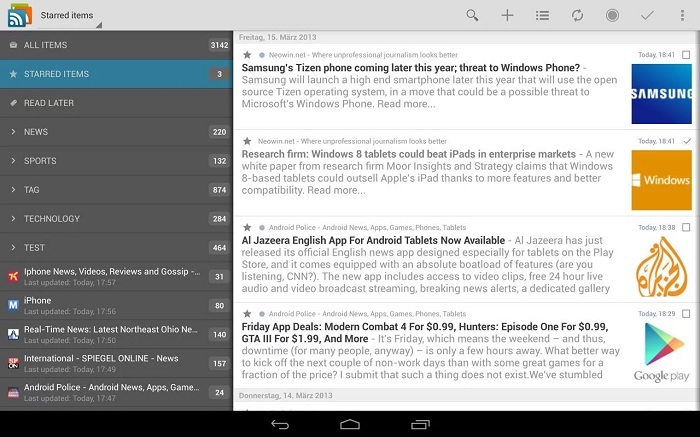 The app comes with support for Feedly Cloud and The Old Reader, and allows users to read news on their Android device. Recently, gReader for Android received an update, bumping it to v3.6, and introduced several new features and bug fixes to improve the overall experience of the app. The latest update allows users to read gReader as a standalone reader, without any service such as Feedly or The Old Reader. All your subscriptions are saved locally on your device, giving you access to all your RSS feeds on the go. Additionally, users can now customize font settings, including font size, type and alighment. If you’re a regular gReader user, head over to the Google Play Store and download the app. Also share with us your reviews about it.